Pump It Up is the pioneer in birthday party entertainment. Founded in Pleasanton, California in 2000, it was an immediate success, allowing parents to host children’s parties in a private, safe, and clean environment. Due to its popularity, Pump It Up Fresno-Madera opened in 2004. Pump It Up Fresno-Madera's is the largest private indoor party center. We're located on Avenue 10 near Children's Hospital off HWY41 in Madera, CA. We feature 8 huge gigantically fun inflatables for every party in two huge arenas! 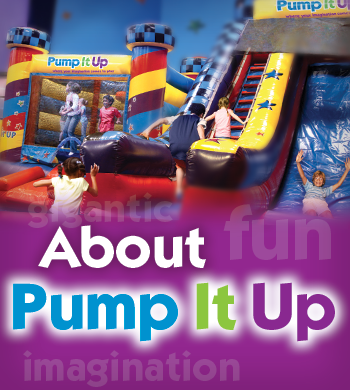 Visit our 'Inside Pump It Up' page to see each attraction! Pump It Up is unique in that we can help you customize your special event and every party held at Pump It Up is always 100% private, so you and your guests can really enjoy this time together. From reserving your event to packing your car after it, Pump It Up captures the experience you want for your next special day!